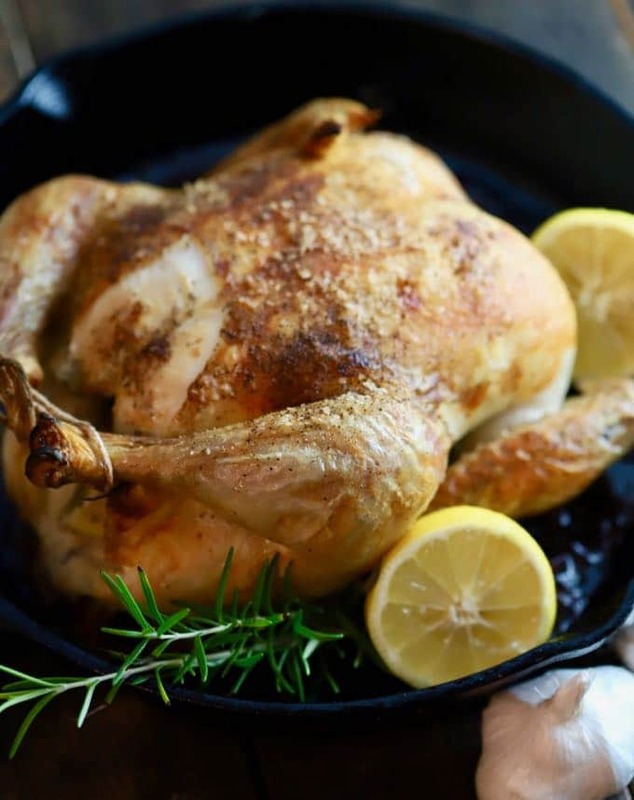 Simple Crispy Roast Chicken, when oven roasted in a cast iron skillet, has deliciously crisp skin, with flavor-packed, tender, and juicy meat. This main dish is easy enough for a weeknight dinner, but it’s also fancy enough for company or a special occasion! Crispy roast chicken is classic comfort food, and in many parts of the country, it’s is a Sunday supper tradition. 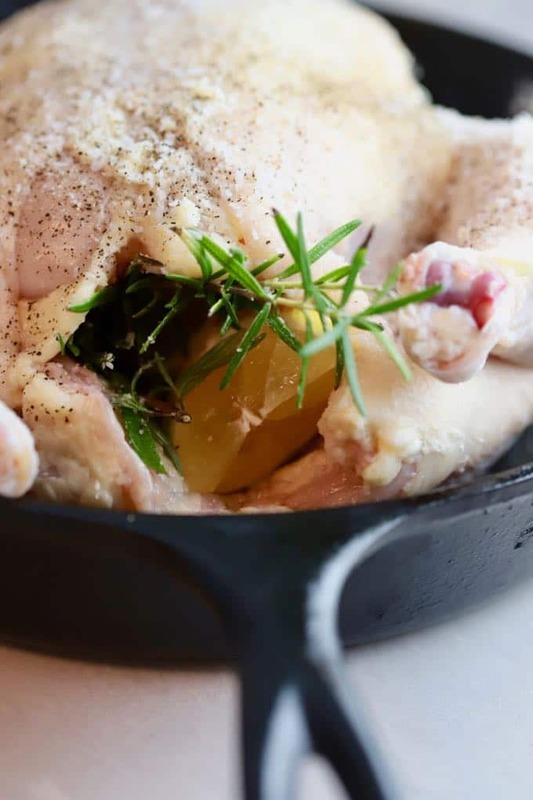 And while you can certainly roast a whole chicken in a regular baking pan, it is also one of the best recipes to cook in a cast iron skillet. Simple Crispy Roast Chicken Recipe is generously seasoned, slathered with butter; then oven roasted to crispy golden perfection. Juicy on the inside, and loaded with flavor, this roast chicken recipe will quickly become your “go-to” favorite. It only takes about 15 minutes to prep the chicken to get it ready to roast. And, a chicken weighing in at about 4 1/2 lbs will take about an hour to an hour and 15 minutes at 425 degrees to cook perfectly. If your chicken is larger or smaller, it will take more or less time. The key here is patience! A bonus: you can use the hour or so roasting time to put your feet up and visit with family and friends. A real plus in my book! Roast chicken is done when it registers 165°F on a meat thermometer inserted in the thickest part of the thigh, and the juices run clear. A reliable digital instant-read meat thermometer is a must when cooking chicken or any type of meat and will guarantee it is perfectly cooked every time. I use a DOT thermometer which is inexpensive and consists of a probe which is inserted in the meat while it cooks. Basically, you just set the desired meat temperature and when it is reached the DOT beeps. It works great for foods cooked in the oven or on the grill. What to serve with Simple Crispy Roast Chicken? Roast chicken is so versatile; you can practically serve any of your favorite sides with it. I usually serve it with either Creamy Make-Ahead Mashed Potatoes or Easy Southern Potato Salad and in the summer Southern Cucumber and Tomato Salad. If you need more ideas, simply click on the links for all of my side dish and salad recipes. In the unlikely event, you have any leftover chicken; it will keep in the refrigerator for up to 5-days. If you want to freeze it, store it in airtight freezer bags in the freezer for up to 3 months. Leftovers are also great for chicken salad, my Chicken, and Wild Rice Casserole or for an unforgettable Roasted Chicken Noodle Soup. How to make Simple Crispy Roast Chicken every time! Remove the chicken giblets and pat the outside of the chicken dry with paper towels. Take the handle of a wooden spoon and insert it between the skin on the breast and meat to gently loosen the skin so you can spread the butter under the skin. Take about half of the softened butter and use your fingers to insert it under the breast skin. Spread the remaining butter out evenly over the rest of the chicken. Liberally sprinkle salt and pepper inside and on the outside of the chicken. I know this seems like a lot of salt, but trust me you need it. 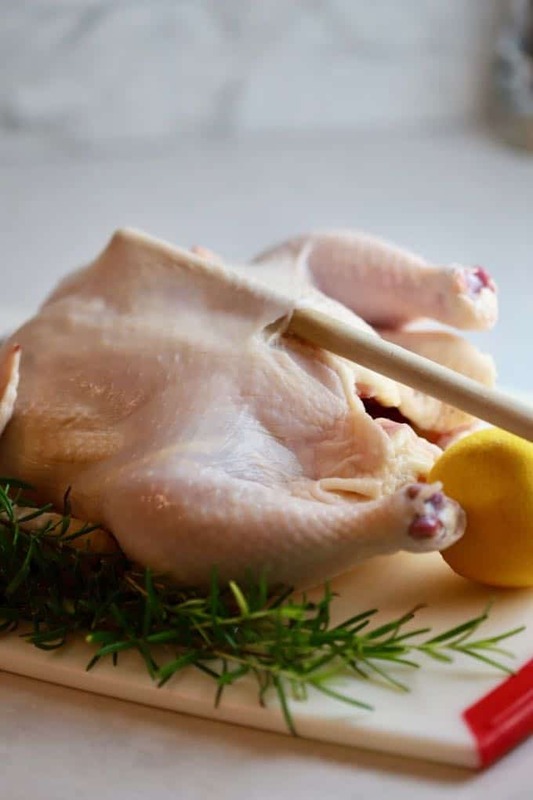 Put a lemon which has been quartered, 2-3 cloves of peeled garlic and 1-2 sprigs of fresh rosemary in the cavity of the chicken. Tuck the wing tips under the chicken and truss (tie together) the legs with kitchen string. 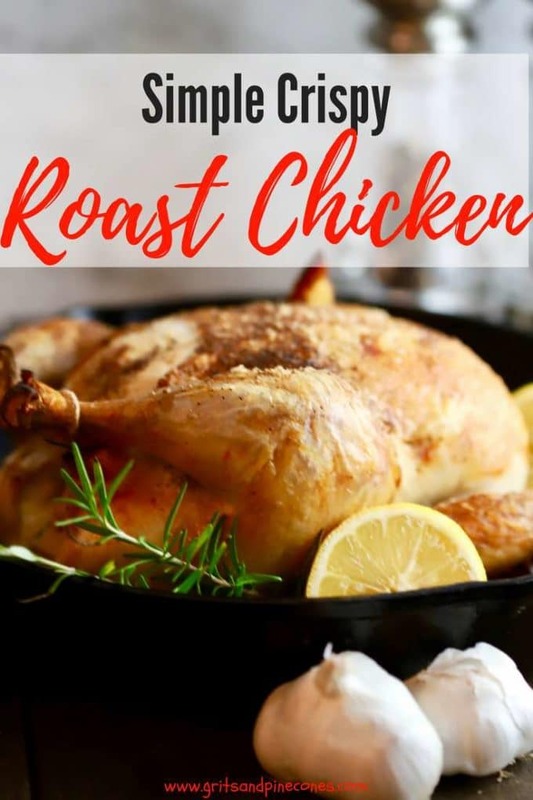 Roast the chicken for about an hour to an hour and 15 minutes for a 4 1/2 pound chicken, or until it is browned and has reached 165 degrees. To test for the temperature, insert a meat thermometer in the thickest part of the thigh being careful not to touch the bone. A larger chicken will require more time, a smaller one, a little less time. 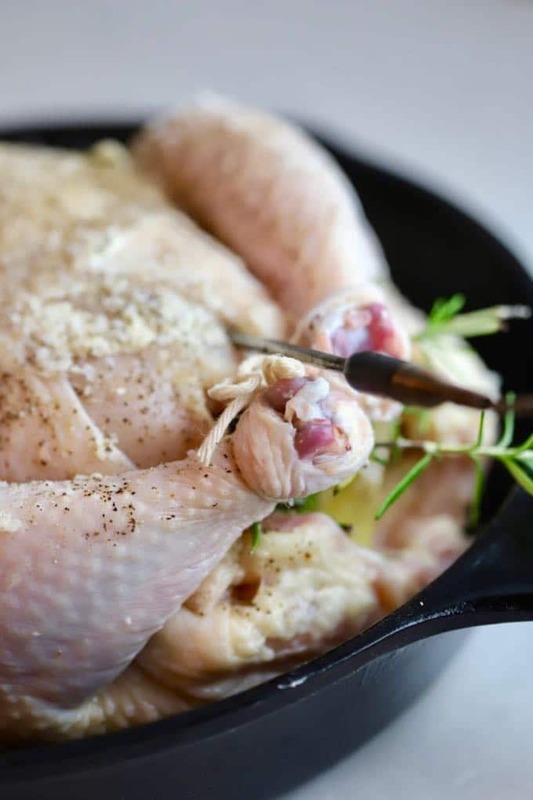 Once the chicken has reached 165 degrees, remove it from the oven and immediately tent it with aluminum foil and let it rest for at least 15 minutes. To serve, garnish with lemon slices and rosemary or parsley. *This recipe was originally published December 14, 2015. Republished on August 8, 2018, with new photos and a simplified recipe. 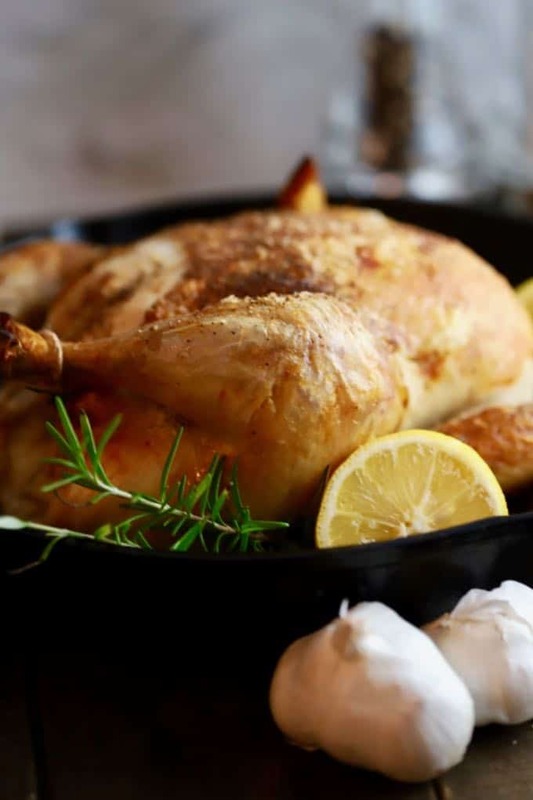 Cooked in a cast iron skillet, simple crispy roast chicken is juicy and flavorful. It's great for a weeknight dinner and fancy enough for Sunday supper. 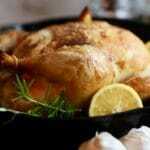 Place the chicken in a well-seasoned 10 or 12 inch cast iron skillet or a shallow baking dish. (If you use a baking dish, spray the dish with non-stick cooking spray. Take the handle of a wooden spoon and gently loosen the skin on the breast so you can spread the butter under the skin. Roast the chicken for about an hour or an hour and 15 minutes for a 4 1/2 pound chicken, or until it is browned and has reached 165 degrees. To test for the temperature, insert a meat thermometer in the thickest part of the thigh being careful not to touch the bone. A larger chicken will require more time, a smaller one, a little less time. Sharon, you always have the best recipes! Also, I love your suggestions on what to serve with this crispy chicken. You are so sweet! Thank you so much for your kind comments!